In style they do, indeed. 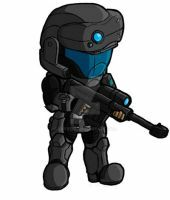 Spartans are modified supersoldiers, born to fight and they have a much better amor than ODST's. "Most of the crew - not to mention your fellow jarheads - will be leaving the ship in lifeboats. They'll ride to the surface in air conditioned comfort, sipping wine, and nibbling on appetizers. Not you, however. Oh no, you're going to leave the Pillar of Autumn in a different method. Tell me boys and girls... how will you leave?" "ooh ooh! In a little box with faulty parachute systems!" WE GO FEET FIRST SIR! My luck I'd end up like buck did in halo 3 ODST haha upside down pod "ILL GO HEAD FIRST!!" WE GO IN FEET FIRST. OH YEAH!!! This is so true!!! Just to clarify, doesn't ODST stand for "Orbital Drop Shock Troopers" or something like that? I don't like being wrong about Halo stuff, so I had to ask. No worries, your not the only one who has had trouble with that acronym. I still can't figure out what MAC stands for in the halo series. And ODST really stands for "Official DUMB*** Stupid Trooper". According to the canon fiction, the ODSTs are the guys who released the Flood from the depths of the Halo. According to the game halo combat evolved, it was a bunch of normal marines. Either way, different versions have slight changes in story. When Bungie released Halo 2, they made mention in that game about the ODST releasing the Flood. It's kinda hard not to release something when you don't know where you are in the universe. The human mind tends to get curious. They probably had a bad day to begin with anyway. Oh darn! I read about that just a few weeks ago, I should remember! What it was for was a type of space gun when Harvest was fighting the covenent. That's when I first read about it! If I read that book, again, I might be able to tell you, cuz it was in there somewhere! Actually, what they used on Harvest was a Mass Driver that was used for shooting cargo pods into space, but they used it as an improvised MAC when Brutes began their attack. Hey, you were close enough. No big deal, really. true fact. Besides, how many other squads in the Halo universe do you know that manned a Firefly? NONE! That is so true. I actually do like ODSTs way better than spartans. They somehow manage to be just as badass as spartans without all of the enhancements.